May is National Walking Month encouraging people to get outdoors and go for a walk. This might be the time for you to give Nordic Walking a try. Walking with poles has been around for decades but it’s only recently that Nordic Walking’s popularity has increased and it has become quite a common sight to see people walking with two poles. I can guarantee that they aren’t looking for snow! These specific Nordic Walking poles play a key role in achieving the benefits of walking as they add propulsion and a bit more excursion to your walk; in fact, they contribute to an increase of about 46% in energy consumption compared to a normal walk. This benefit results from using more muscle groups incorporating your upper body – triceps (bingo wings), lateral muscles, pectorals and your ‘core’ – all the stabilizers of your body. The result is a significant rise in heart rate. Not bad, eh, as the effort isn’t that much more. Used correctly, with every stride you take in conjunction with the swing of the arm, the poles are planted behind you thus propelling you forward. Once you get the hang of it, you take pressure off of joints (especially knees) and lower back which results in a much better posture. This, in itself, brings so many benefits due to less stress going through the shoulders and back, as well as opening our airways to breathe in all that fantastic oxygen that fuels our muscles and organs, giving us that feel good factor. Nordic Walking is suitable for all, a gentle way to getting back into exercise, assisting rehabilitation, beneficial for muscular conditions, and to the really fit, an addition to their cross training regime. We are in a world of slouching and looking downward, mobile phones, computers, driving cars to work and back, then sitting in front of the television, only to do it all again the next day. Our body biomechanics work in synergy so you can see why the government is declaring a month of getting outdoors and walking! Nordic walking isn’t about walking fast at all, this is something that happens as a result of good technique; the rhythmic motion of our stride and excursion as we engage through the poles is down to you. 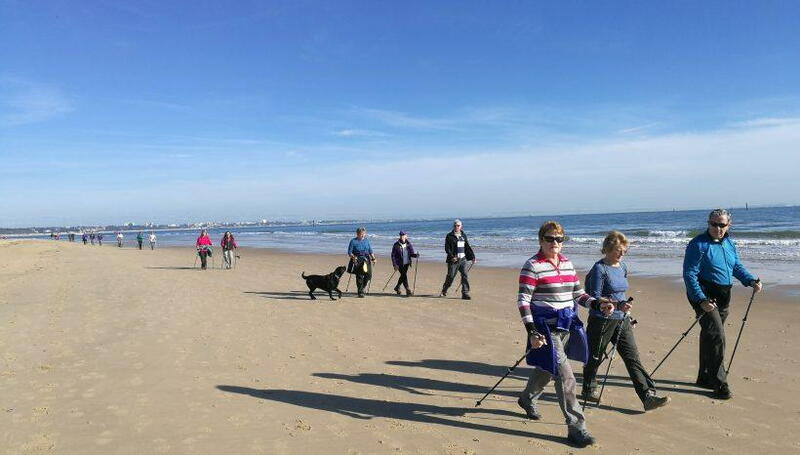 I have been teaching, organising local walks and arranging walking holidays here and abroad for the past 5 years and one of the premium benefits of this fantastic outdoor activity is the ‘Sociable Fitness’; so many friendships have come out of Nordic Walking, smiling , laughter, chatting and walking as we discover new places, get fit and be happy. They say Nordic Walking uses 90% of our muscle groups and the added bonus is, if you walk and talk, 95%!! Why not come and give it a try! See how many muscle groups you can use and Turn a Walk into a Workout Free Taster and 15% off any Technique/ Refresher Course off in the month of May ! If you would like to try Nordic Walking, contact Lynne Martin for details.